I was supposed to attend the Motor City Con this weekend (May 18-20). 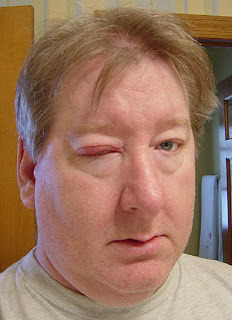 However I have, somehow attracted an infection in my eyelid (OUCH!). It has swollen my lid to the point of almost closing the eye. (Don't look at the pic if you get queasy easy!). I am on medication for it and it is not contagious, which is good. But it makes me look like Quasimodo! My apologies to all who are going to MotorCity. I hope to catch you all again sometime soon! Ow. You have my deepest sympathies, Dave. Ouch. Rest up and get better fast, Dave! I recommend putting your feet up and watching lots of TV, an excellent source of radiation.